Provide a container and mix the sweetened condensed milk and liquid milk until evenly distributed. Prepare a container back to mix water and flour, the dough should not dilute terlelu. Kcok egg yolk part until smooth and fluffy. After 3 batter was finished later mamsukan batter of flour, eggs to milk mixture, add the butter, sugar, then mix in boiled until evenly mixed using a small flame until cooked. 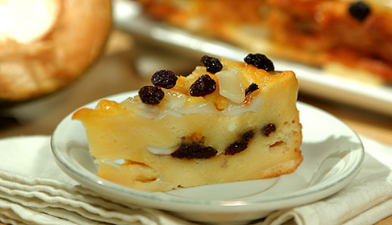 Provide a baking dish then cover with the use of aluminum foil, pour the mixture into a baking dish and sprinkle with raisins, cinnamon, knari as its topping ingredients.